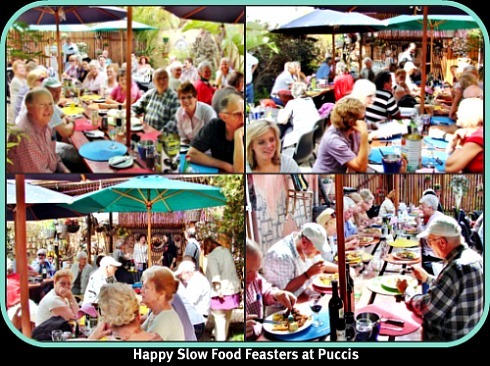 An enthusiastic crowd of nearly 50 people arrived at Puccis Pizza and Pasta Restaurant on Thursday 18 October to attend Sedgefield’s 6th Slow Food Workshop. 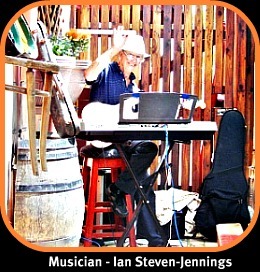 We were able to get ourselves comfortable in the pleasant private outdoor courtyard at the back of the main restaurant where Ian Steven-Jennings was already playing his melodious background music. 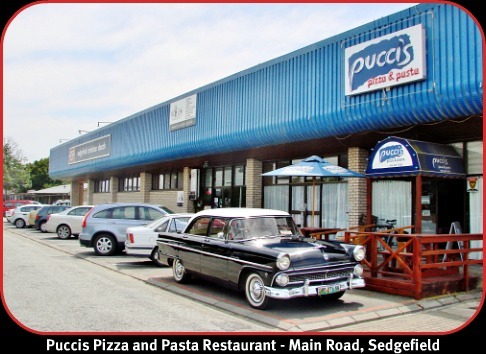 Chef Colin Capon began by introducing our hosts for the day, Guiseppe and Esther Slaviero who have been running their popular restaurant, Puccis in Sedgefield since 2005. They don’t usually open for lunch but agreed to on this occasion in order to host our workshop. They had some help in the form of Joanne in the kitchen, their goddaughter, Gia as a waitress and a longstanding and good friend Paolo to assist in the restaurant to keep things running smoothly. 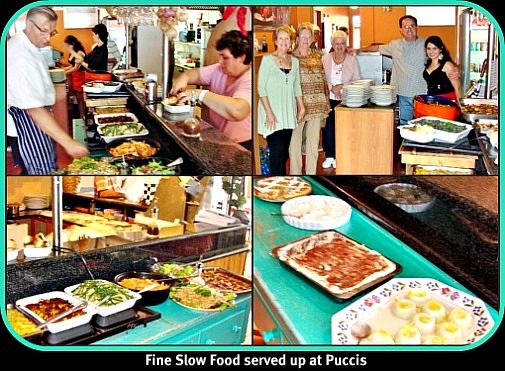 They cheerfully said there’s no fighting in the Puccis kitchen only lots of fun and laughter. Colin then decided it was time to announce the committee for our Slow Food Convivium as he wants us to register with the International Slow Food movement in Italy because of the many benefits we will receive from becoming a member of the organisation. From January 2012 a more structured way of participating in the Convivium will be instituted. 1. An annual membership to the local convivium will be R160-00. 2. International annual membership will cost Eur 5-00. Members who pay for international membership will only have to pay R100-00 for local membership. 3. A member will thereafter pay R75-00 per regular workshop if he/she does not present a dish for the meeting. 4. A guest is someone who has not paid membership fees. He/she will be required to pay R100-00 to attend a workshop.Note please that at times the workshop (12am-3pm) could cost more than R75-00 depending on the venue and the programme planned. Members will be advised in advance when this occurs.It also should be noted that whilst the convivium presently involves a lunch where many people contribute to the themed menu, it will not continue to be the sole purpose of the Slow Food Convivium.To properly understand the vision and long-term aims of this organisation, please click on the link below relating to the Slow Food movement. As much as we all enjoy the scrumptious fare that has been on offer at every single workshop so far, there is a much wider objective to be realised. The monthly workshops are just the beginning – a small part of a bigger picture. Colin then introduced Lemoncello which is a typically Italian liquer. He said we could make something very similar by scrubbing a few lemons clean and then slicing up the skin very thinly to add to a litre of vodka. Leave it in a cool dark place for 1-2 weeks. Meanwhile add sugar to the lemon juice and then add a bottle of vodka. Keep this in the fridge for 10 days. Strain the skins out of the first bottle and then mix the two liquids together. It makes a very refreshing alcoholic drink that can be used in many ways. We were later to taste some ‘babas (doughnut type dessert) that had been soaked in this liquer – very delicious! Puccis then treated us to some antipasta (starters) that consisted of small garlic breads to be eaten with a choice of olives, salami and artichokes. 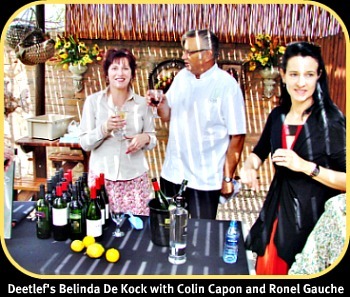 Belinda De Kock from Deetlef’s Wine Estate then thanked Andre Gauche for choosing their brand to represent Sedgefield’s Slow Town. A Savignon Blanc Semillon is the white wine and a Cabernet Sauvignon is the red. 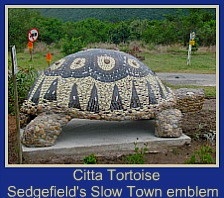 They are quality wines at a very affordable price and have been attractively labelled to promote Sedgefield’s recognised qualification as Africa’s only Slow Town affiliated to the founder member, Cittaslow in Italy. Belinda brought a number of other wines from Deetlef's Winery with her and a good number of tasters had the opportunity to enjoy some samples and to purchase what they liked. Two gentlemen, Peter van Wezel and Bernard Sheridan were then ignominiously roped into a pizza-making competition. They had to roll out their dough and arrange their own topping from ingredients provided. Chef Colin then arbitrarily nominated 3 judges to judge the result. Peter won but as hungry diners wolfed down the remains, both men were winners – everyone thought the pizzas were terrific! The selection of delicious Italian dishes that followed was definitely worth the wait. A beef ragu with mushrooms and fennel called “Carni Milanese” was the signature dish of Puccis. Esther said it had been a dish her mother made. Puccis also made a delicious pear dish incorporating Gorgonzola cheese and sweet chilli sauce. 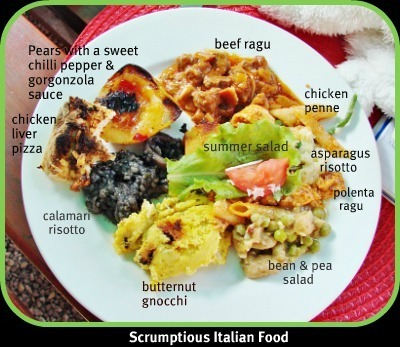 Then there was butternut gnocchi, calamari risotto, bean and pea salad, summer salad, chicken penne, asparagus risotto, polenta ragu and garlic focaccia. Later equally divine deserts followed - a sweet ricotta tart with cream, lemoncello babas, tiramisu, panna cotta with strawberry sauce and panna cotta with lemoncello. Puccis was another splendid venue for our Slowfood workshop. Our thanks to them for their hard work and for their contribution to the success of the lunch. Thanks to all the enthusiatic foodies who contributed their own special dishes. We couldn't resist a small taste of all of them and they were unfailingly delicious! As always, kudoes to our great chef, Colin Capon who puts a great deal of time and effort into these occasions and makes it all look effortless, when indeed it is not! Deetlef’s is the 3rd oldest wine estate in South Africa with a fascinating history that spans 7 generations. It is a heritage that cannot be bought! The current owner, Kobus Deetlefs says "Each of the generations contributed in their own unique way. A golden thread runs through our history, reflecting a boldly individual approach, a strong set of values and a long-term focus. Currently it is my responsibility to create more opportunities for generations to come and to tell the story…"
Slow Food is a grass roots organisation founded by Carlo Patrini to link the pleasure of good food with a commitment to community and the environment with the aim of protecting local heritage, tradition and culture by defending food biodiversity. The organisation opposes food industry multinationals and industrial agriculture. It organises fairs, events and markets to connect consumers directly with producers to help make them aware of where their food comes from and the impact of their food choices. The organisation has developed a worldwide network of sustainable farmers that work with cooks, and academics to collaboratively improve our food system…..